Balboa Park has something for everyone, with 16 museums (pro tip: free admission on Tuesdays for residents! ), 16 botanical gardens, our world famous San Diego Zoo, and dozens of other amazing attractions. Obviously our San Diego weather needs no defending, but the knockout punch is Balboa Park's off-leash dog parks, of which there are THREE. Central Park has zero for those who are counting. Even if you don't have a (well socialized) dog (with good recall), stop by Grape Street Dog Park just to elevate your mood. It's really hard to be cranky around so many dogs getting to sniff buttholes socialize, sprint, chase balls, roll in pee lay in the sun, and just enjoy a little freedom. Seriously, all those wagging tails and panting tongues are like therapy. Unless you step in poop. In flip flops. Yes, I have experienced the squishing sensation of cold, dog poo in between my toes, and it's definitely a world ender. I think I needed actual therapy after that one. Anyhoot. Balboa park is HUGE, and it can get overwhelming, especially when visiting with a dog. Luckily, there’s now an app for that. With their 2015 Celebration in full swing, Balboa Park is taking a major step towards changing the way its visitors, two-legged and four-legged, experience the park. With the recent launch of the Balboa Park App, we don't have to plan ahead, we can wing it and nail it, with or without fur kids in tow. Also, the app is free, which is basically a deal breaker because Mami and her money are not easily parted by the app store. Seriously. I think the last app I paid for was "Plants vs. Zombies" in 2009. So I downloaded the app, and it's easy to use and navigate. Grape Street Dog Park is my favorite place on earth, so I wanted to know how easy it was to find, and even I could figure it out easily. Here's what you do: after downloading the app, press the menu button and select “Things to Do” from the drop-down menu. Select “Dog Parks,” and boom. Clear, instant information on all three of Balboa Park’s dog parks, off-leash hours, maps to their locations, visitor reviews, parking information, and more. This is something any dog parent can appreciate, especially if you've got a mouth breather drooling all over your leather seats. If your dog is still working on recall, socialization, or you just want to explore other areas of Balboa Park with on leash, there's a lot of other stuff to do besides the off-leash dog parks, and there's no need to spend hours wandering around until you stumble upon something (although that is a great way to spend an afternoon too). The “Recreation” section of the app shows hiking trails, gardens, and pathways that are perfect for leashed dogs. Information also includes difficulty levels, terrain details, path lengths, maps, and more. It’s a great tool for gauging how much water to bring for your pup, or how much sunscreen to bring. This app isn't stopping there. Guru Technology partnered with The Balboa Park Online Collaborative in creating the Balboa Park App, and they are set to take the partnership one step further to bring upgrades inside the park museums as well, transforming the way guests of every age connect to collections and exhibits. This will provide a technological bridge between museums and the 21st century visitor, transforming a traditional museum experience into something interactive, immersive, compelling, and fun - all through guests’ personal smartphones and tablets. If the current functionality of the Balboa Park app is any indication, I can't wait until Guru moves on to the next step with the museums, zoos, and cultural centers in Balboa Park, and even better, across the country. SD > NY. West Coast fo lyfe. Plants vs. Zombies was awesome. For the love of God, watch your dog and pick up her poo or go step on a lego. To get the Balboa Park App, you can text “Balboa app” to 56512. It's also available in both iTunes and the Google Play store. If you're interested in this and future museum apps, follow The Guru or contact Paul Burke (pburke@theguru.co). See you at Grape Street Dog Park! I'll be the one NOT in flip flops. Happy exploring! 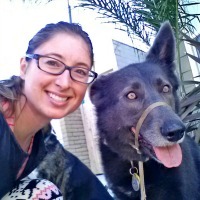 Hi, I'm Ali, co-founder of Doggie Joggie, a pet care company in San Diego specializing in dog running, dog walking, dog training, and pet sitting. My official title is "Director of Happiness", and my favorite parts of my job are talking too much, discovering new parts of San Diego on foot, and kissing dogs on the mouth. Connect with Doggie Joggie on Instagram or Google+ and stay in touch!